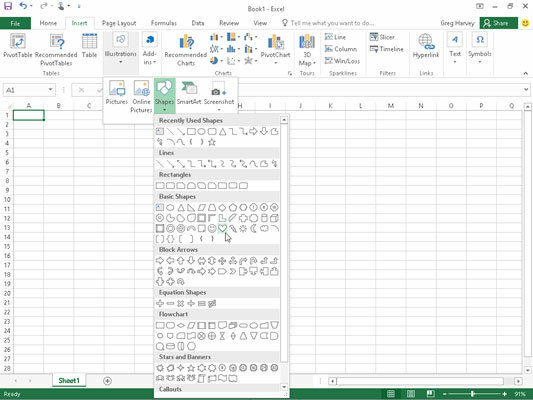 In addition to online and local images, you can insert preset graphic shapes in your Excel 2016 chart or worksheet by selecting their thumbnails on the Shapes drop-down gallery on the Insert tab of the Ribbon. Click the shape’s thumbnail on the Shapes drop-down gallery and then drag the mouse pointer or Touch Pointer to draw it out in the chart or sheet. When you open the Shapes gallery by clicking the Shapes button in the Illustrations group on the Insert tab of the Ribbon, you see that it’s divided into nine sections: Recently Used Shapes, Lines, Rectangles, Basic Shapes, Block Arrows, Equation Shapes, Flowchart, Stars and Banners, and Callouts. After you click the thumbnail of a preset shape in this drop-down gallery, the mouse pointer becomes a crosshair you use to draw the graphic by dragging it to the size you want. After you release the mouse button , the shape you’ve drawn in the worksheet is still selected. This is indicated by the selection handles around its perimeter and the rotation handle at the top, which you can use to reposition, resize, and rotate the shape, if need be. Additionally, the program activates the Format tab on the Drawing Tools contextual tab, and you can use the Shape Styles gallery or other command buttons to further format the shape to the way you want it. To set the shape and remove the selection and rotation handles, click anywhere in the worksheet outside of the shape.